“Man overboard!” cried Andrew at the start of his first ever MOB drill. Still in the confines of Sydney harbor, we were going through some safety basics before the 30-nautical-mile day sail to Ingonish, our final New Scotland port of call. As a double-handed crew, I selfishly wanted to know that Andrew could save me if the unthinkable happened and I ended up in the cold water. Just like with everything else I threw at him during the safety orientation – fire safety and suppression, abandon ship procedures, MAYDAY call protocols, and more – he quickly demonstrated competency at saving “Bob,” the crumpled newspaper I chucked overboard to start the MOB exercise. Not just any new crew, Andrew’s skills are literally battle tested. Recently honorably discharged from the Air Force, he starts his time on the Windleblo as part of a year transition from military service to civilian life. I first got to know Andrew more than 10 years ago as John Hoopes’ high school classmate and good friend. While John was heading off to Tufts University, Andrew was an incoming doolie at the Air Force Academy, beginning ten years of service that included the Academy, an Air Force Presidential scholarship to Harvard graduate school, Air Force tactical air control party training, a flight commander assignment, and a combat deployment in Afghanistan. The Windleblo now enjoys the benefit of all that training and experience – a shipmate with confidence, skill, and attitude to take on whatever gets thrown his way. Experience galore, but never as a sailor. By enlisting in this voyage to Newfoundland, Andrew wants to sample the adventure of a cruising sailboat with an eye on going sailing himself one day. Perhaps the next few weeks will tell if more sailing is in his future. Over dinner, I asked Andrew what he would want to look back upon at the end of his time aboard. “I want to learn as much as I can about sailing,” he replied. There were many firsts for Andrew this day. First day in Canada. First MOB drill. First sail in a cruising sailboat. First time rowing a dinghy. 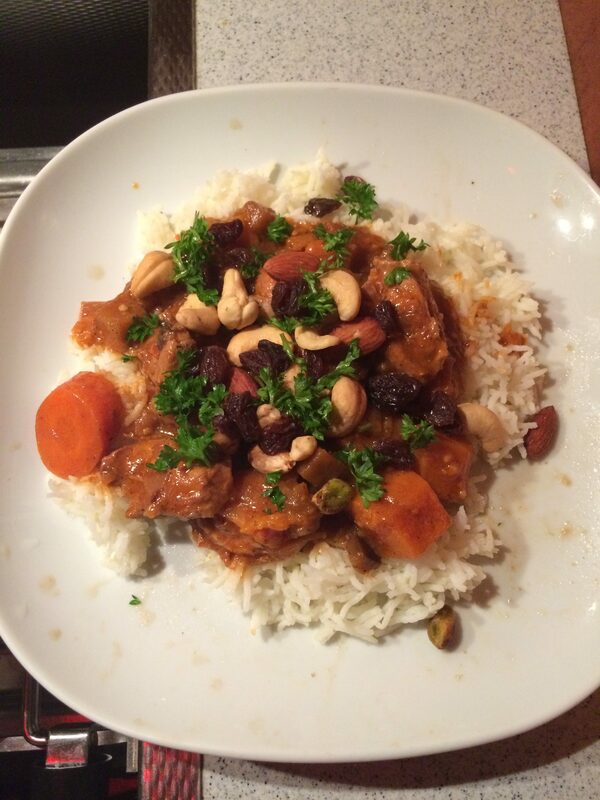 First chance to enjoy a meal cooked by his captain – tossed green salad starter, chicken curry over rice main garnished with raisins, nuts, and parsley, washed down with homemade bubbly water. We spent two nights in Ingonish waiting for strong winds to subside. 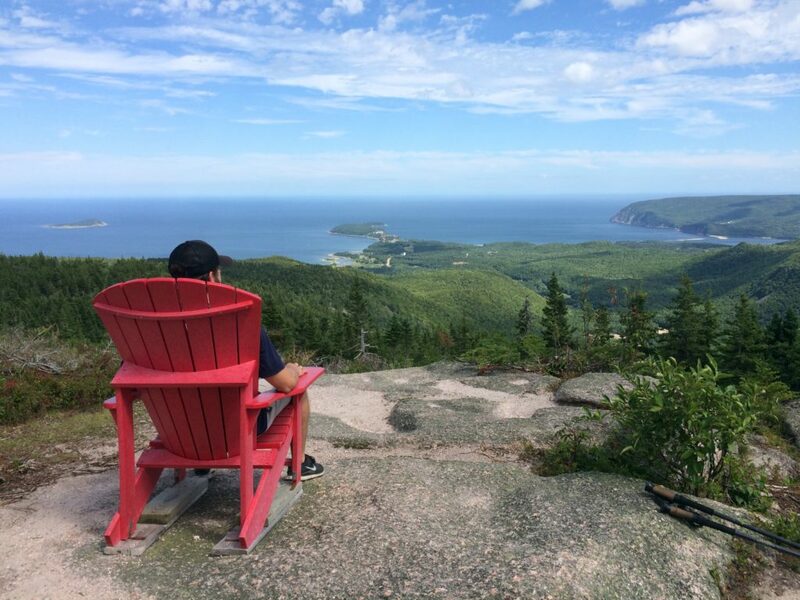 Ingonish is on the doorstep of the Cape Breton Highlands National Park. 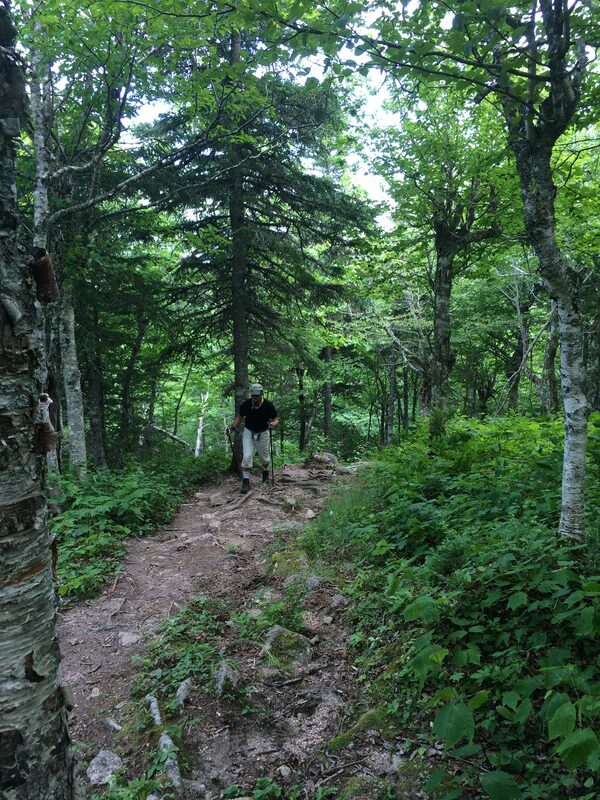 We enjoyed two fine hikes to the top of the hills near the harbor, one inside the park and one just outside. 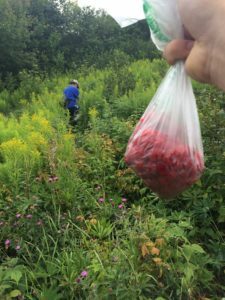 On the trail, we talked about sailing, took in stunning views, and foraged for wild raspberries. 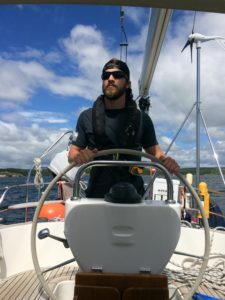 I began Andrew’s sailing education with instruction on a few Windleblo basics — preparing to get underway, anchoring and docking, rig inspection, obtaining weather, piloting, and navigation information, helming, and of course how to operate the head, among other things. I warned him it would be like drinking from a fire hydrant, but he never seemed overwhelmed. crossing to Newfoundland. You can review his work in my next post. Push the MOB button on the Furuno chartplotter. Take the helm and turn the wheel 180 degrees to windward to crash stop the boat. Walk calmly to the transom and deploy the MOB gear – danbuoy, horseshoe buoy, and lifesling. Return to the helm. Sheet in the main to pin the boom to the centerline. Ensure there are no lines in the water. Start the engine. Circle “Bob” with the lifesling. Once he has it, stop the boat and haul him in. View from the top of Franey trail, Cape Breton Highlands National Park.